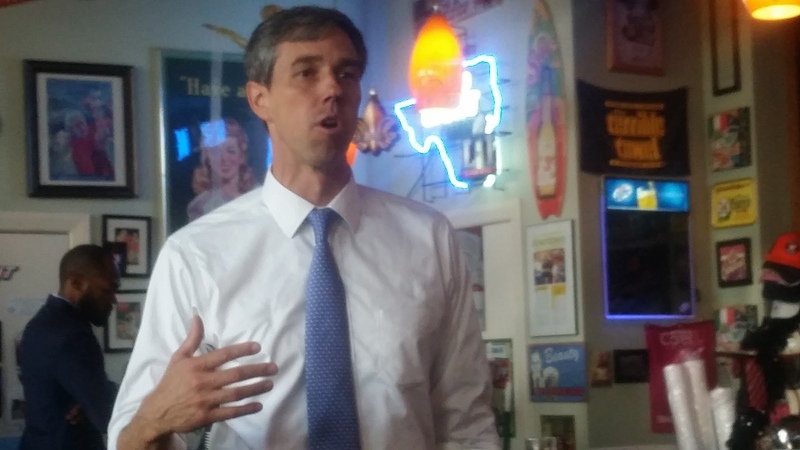 Continuing to make the rounds around the state of Texas, Beto O’Rourke, Democrat for US Senate, has spent a couple of days in Houston rallying supporters and volunteers. Friday morning, one of his stops was at Irma’s Restaurant in downtown for a meet and greet breakfast with local Latino activists and community leaders. A capacity crowd enjoyed a frank conversation with O’Rourke, who touched on issues such as post-Harvey efforts, health care and public education; however, a good portion of his presentation and the Q&A that followed concentrated on the human rights crisis at the US-Mexico border. Much of the crisis has been given steroids by the Trump administration as they separate families and warehouse children in badly managed private prisons. Although he states that he is and has been willing to work across the aisle on sensible solutions, he states that Republican delays and obstruction to these solutions will only be ended at the ballot box when Democrats become a majority in both houses of Congress. O’Rourke stated his strong opposition to family separation, arrests and prosecution of parents requesting asylum, and child imprisonment. He also stated that he’s among those in Congress working on comprehensive solutions today, as we can’t wait for things to align before doing something. During the Q&A, one elected leader, Goose Creek ISD Trustee Agustin Loredo, brought up the fact that much of the migration has been caused by US government and US corporations interfering with social, political, and economic standards of Mexico and Central American countries. O’Rourke agreed that there must be a better way to help these countries succeed that respects their government and economic systems, citing past US military operations which have removed democratically-elected leaders, only causing chaos and destabilization. After taking questions, O’Rourke spent time speaking one-to-one with those attending. I’ve always been impressed with Beto O’Rourke and remember when he defeated an entrenched–Bill Clinton-endorsed former Border Patrol chief–incumbent. So, he knows about tough political work. Above all, he’s a good listener. Honestly, I haven’t felt this good about a ticket-topper as O’Rourke doesn’t respond to issues based on polls, but on real solutions. He’s sincere and the real deal. Asked about how he will win, he doesn’t mince words. The solution is voter registration, outreach, and GOTV–especially of those non-voting registered voters who have grown disillusioned with voting and government. While he knows his task is a tough one, he also says that it’s up to those who support him to spread the word–call by call, door by door, family member by family member. This entry was posted in Accion, Cultura, Elections, Harris County, Local Politica, Republinuttiness, Sensible Immigration Reform, U.S. Capitol and tagged beto o'rourke, Democrats, ted cruz, Texas, US Senate. Bookmark the permalink.